The Sol Duc Hot Springs Resort is a great place to stay for visitors wishing to enjoy the natural mineral pools and hike around the beautiful Hoh Rainforest. The resort features three hot mineral pools, one freshwater pool, and plenty of chairs and tables for your relaxation and enjoyment. Nearby hiking trails show visitors the best that the Hoh Rainforest has to offer including Sol Duc Falls Trail and Lover’s Loop Trail. Book Online. Where is Sol Duc Hot Springs Resort located? Sol Duc Hot Springs Resort is located in the northern region of Olympic National Park, about an hour southwest of the city of Port Angeles. Exit onto Sol Duc Hot Springs Road/Soleduck Road. 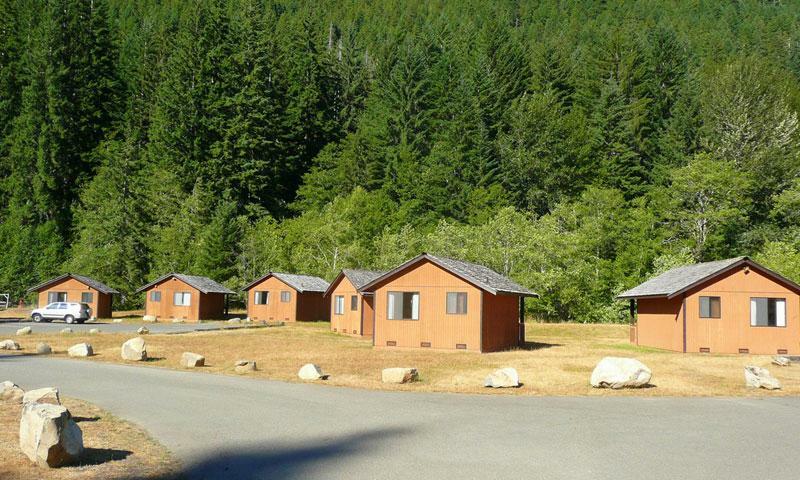 Tell me more about Sol Duc Hot Springs Resort and Cabins. “Sol Duc” means “sparkling water” in Sklallam language. The Quileute Tribe believed that the springs were created by two dueling dragons and had healing properties. On May 15, 1912, timber baron Michael Earles opened an expansive resort on the property. He spent more than half a million dollars on the luxury resort, which included a three story hotel that consisted of one hundred and sixty-five rooms. Rated four stars the hotel included a large spa, gymnasium, tennis courts, croquet grounds, and tennis court. Unfortunately, the entire complex burned down only 4 years later on May 26, 1916.